It is the 2nd of October 2016 and we are bursting with joy over the fact that Shutaro Hayashi, together with his little brother Kenji, again went on the long journey from Kirishima to Frankfurt. Since they announced about 2 months ago, that the Kirishima brothers would accept our invitation to come to Europe in October, we have been overflowing with ideas on what we should do together. 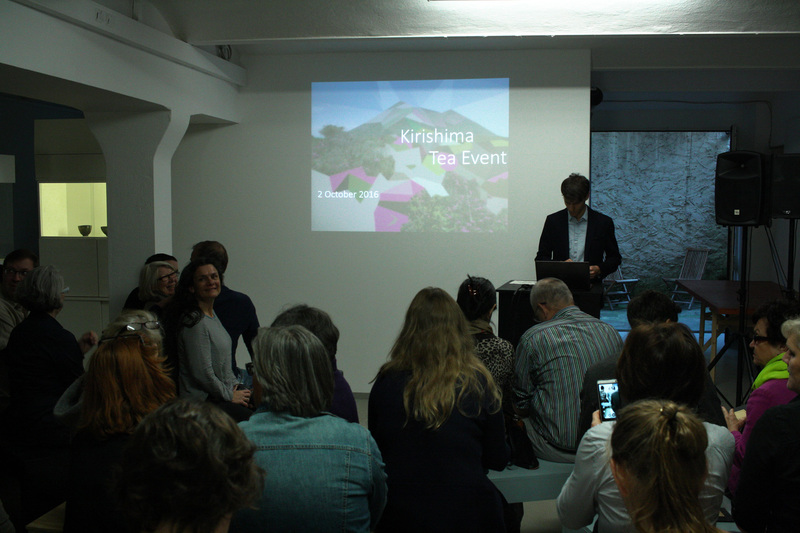 The result: Today’s “Kirishima Tea Event 2016”, an exquisite dinner and the “Welcome Kirishima Party” in the evening, taking into account that the 3rd of October is a national holiday in Germany, which allows most of our guests to rest on the next day. 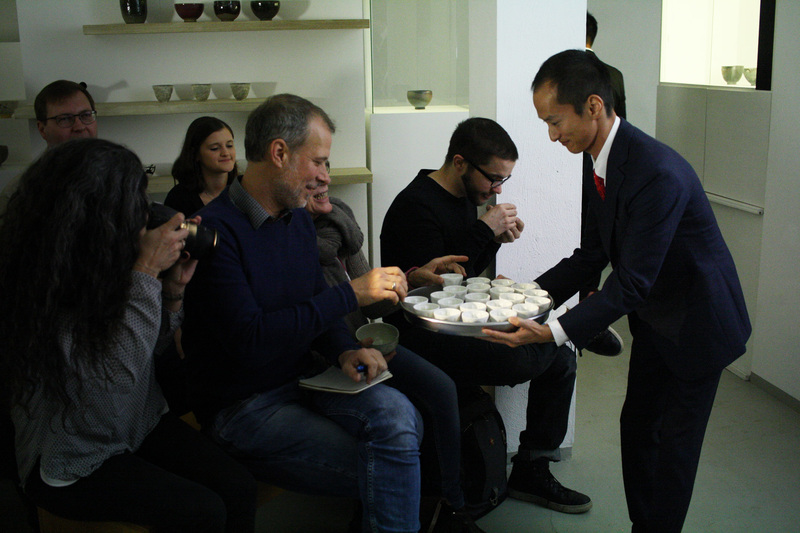 We actually have to go back a little bit, when starting at the picture above, as it shows Shutaro Hayashi distributing Kirishima Tokujou Sencha during the seminar. 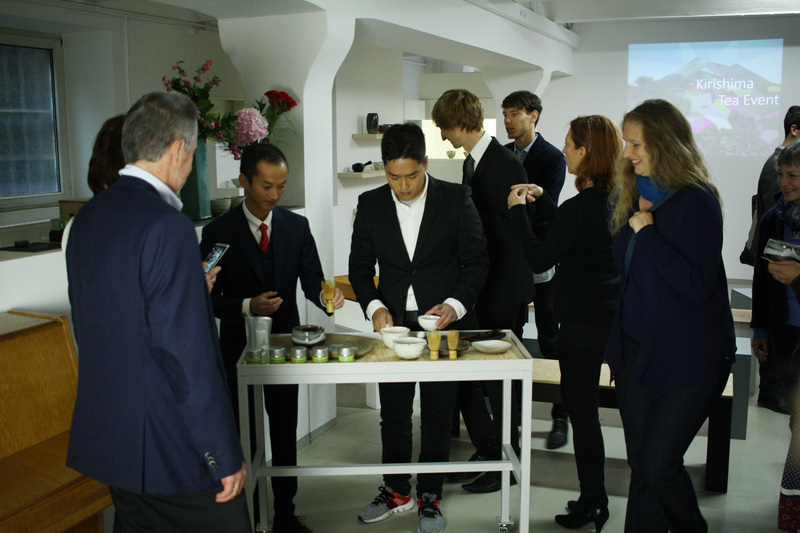 For our guests, who have travelled here from Belgium, France, Austria, Holland and of course from many places in Germany, Kenji and Shutaro Hayashi have prepared a special greeting in the form of a miniature tea ceremony with freshly whipped Bio Premium Matcha from Kirishima. 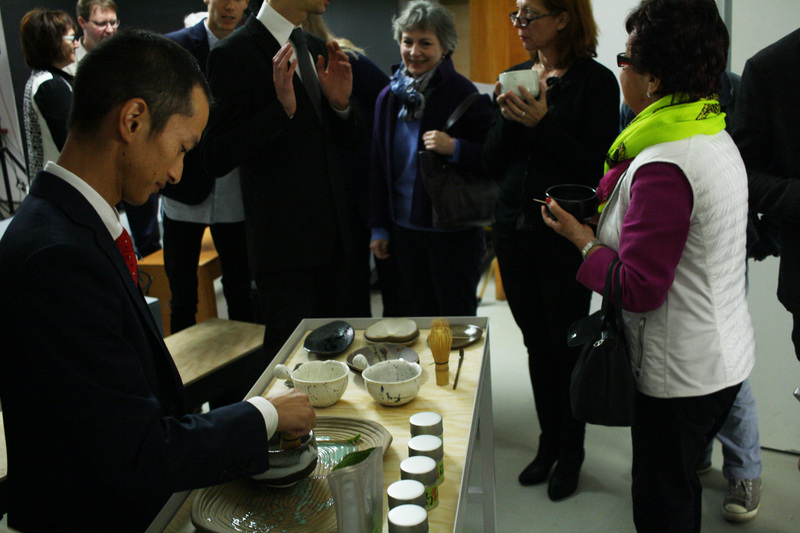 The Miumori Kirishima Matcha, which has only arrived a few days before, was truly able to delight all of our guests. For the special tea ceremony with Miumori Kirishima Matcha, which Shutaro and Kenji Hayashi are preparing for our guests today at the “Kirishima Tea Event“, the two brothers have brought traditional Japanese sweets made from azuki bean flour from Japan. These sweets were made by a very famous confectioner in Japan and are a good match for the high-grade Matcha. 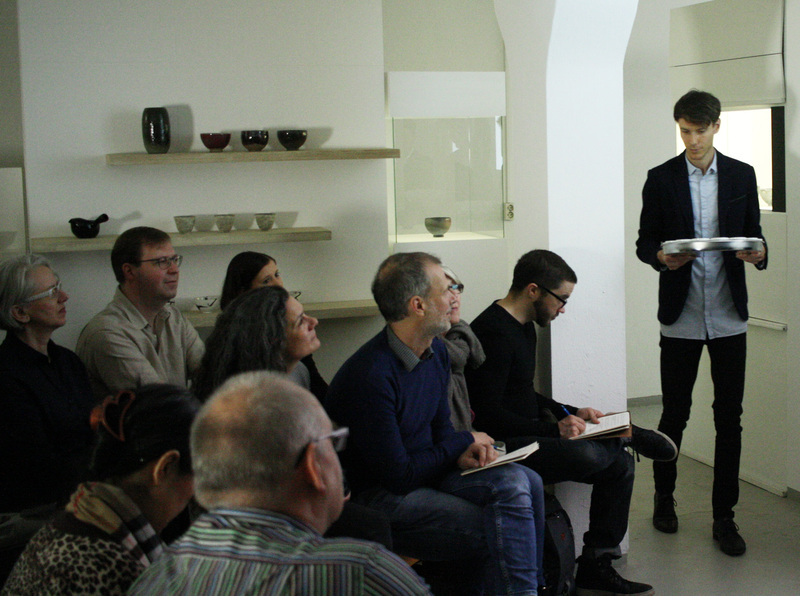 We also indulged in the occasion: instead of preparing simple dishes we selected some works by Narieda Shinichiro for the ceremony. This is a good match because Narieda Shinichiro is almost a neighbour of Shutaro and Kenji Hayashi as he is living only few kilometres away from the Hayashi family teagarden at the foot of the Kirishima mountain range. We visit Narieda’s workshop every year in spring in order to spend some time with him and of course select new works made by him. At these occasions we often also pick small “Kashizara”, special plates for the sweets served during a tea ceremony or while drinking Matcha. We do not buy these plates in order to resell them, but because of their unique designs which we like very much. They are usually on display or sometimes used when we have special guests – like today! The small Kashizara by Narieda perfectly showcase the sweets that Shutaro and Kenji Hayashi brought from Japan and intensify the reverent mood while drinking this year’s Miumori Matcha from Kirishima. We start the seminar part of today's Kirishima Tea Event with a short introduction of the Kirishima Region as the soil and the climate of the region is not only responsible for taste notes of teas produced in the region, but also because Kirishima is also the native region of our two organic tea farmers Shutaro and Kenji Hayashi. Shutaro tells us that in his childhood he climbed the peaks and craters of the Kirishima mountain range every Sunday together with his father. This was certainly not only an athletic exercise but is a special reason why Shutaro still feels very connected to the impressive volcano landscape today. This also affects his style of tea production: He is less prone to improvisation and trying out new ideas, which would produce new taste notes, but he is instead part of the tea farmer tradition of perfecting known taste notes by improving his methods every year. This is certainly a cornerstone of the exceptionally high level of Shutaro and Kenji's Kirishima teas. This connection with the volcano landscape of the Kirishima Region as well as the ties with the style of tea the two brother Shutaro and Kenji is the reason why we decided to report further about different facets of the Kirishima region from now on. 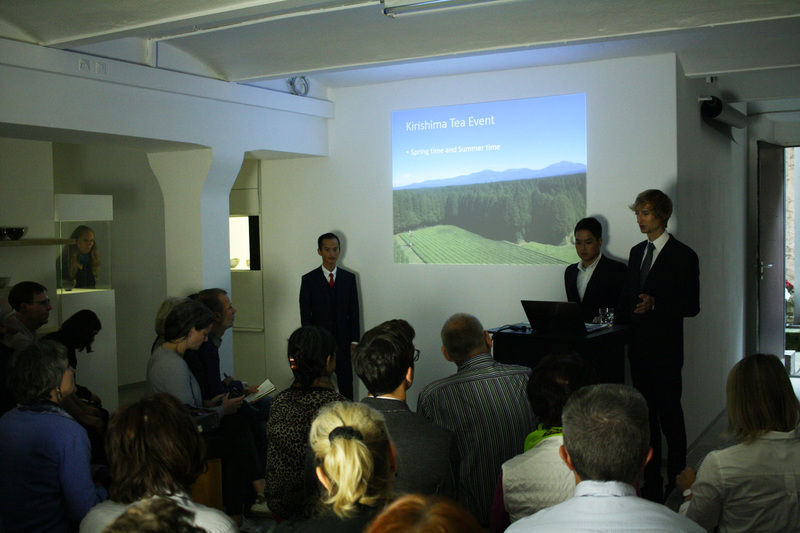 Back to today's event: After introducing the "Kirishima brothers" we start with the change of the seasons in the tea garden. While one would expect to start the year in the tea garden with the first flush harvest in April or in May, we have decided on a different procedure of our seminar: We start with the here and now in form of the autumn harvest, which Shutaro and Kenji will start directly after they have returned to Kirishima next week. This is why we start with a tasting of the Kirishima Aki Bancha, which is made only from the big leaves of the autumn harvest. Of course we are drinking the Kirishima Aki Bancha from the 2015 harvest, as the autumn harvest of 2016 will only start in the next week. The tea bushes are overflowing with vigour during the first flush harvest, like one would suspect during springtime, which allows for a comparably big harvest volume. This is why it is possible to have the luxury of choosing only the finest leaves and only the leaves of bush varieties which one likes very much. With the Aki Bancha this is not possible as the tea bushes are not growing as fast as anymore and are instead preparing for the colder season with less exposure to sun. The Kirishima Aki Bancha has therefore a smaller harvest volume, just like the autumn teas of all other tea gardens in the region. In order to have enough tea for export to be feasible, Shutaro and Kenji Hayashi usually harvest all tea bush varieties in their tea garden equally. This is of course not possible on one day, but usually takes about one week. The harvested leaves are of course steamed and dried on the same day, which is why this tea can be categorised as a Sencha in the sense of steamed tea. But why do we talk about Bancha? The freshly harvested, green tea leaves are of course relatively soft after the steaming. But compared to the first or second flush harvest obviously bigger, thicker and harder leaves are harvested which is why it is not possible to roll the leaves to thin, long needles which is expected from Sencha. This is the very difference, that is important for the definition of the tea variety Bancha. Shutaro and Kenji harvest their Bancha not in summer or in winter, but in autumn, so they have a Bancha of the autumn harvest, which is called Aki Bancha. After the leaves are "folded", since rolling is as explained above not possible, the leaves of the different harvest days are blended, which makes for a balanced cuvée. The next step is sorting the tea with a colour sorting machine, so reddish leaves and bigger leaf stalks are separated. The final result is impressive: big, lightly olive Aki Bancha leaves! The is one important thing to be mentioned in regard to the contents of the leaves: Teas from the autumn harvest have reduced levels of almost all components in their leaves, which is the reason why the level of caffeine is obviously lower than in a tea of the first or second flush harvest. 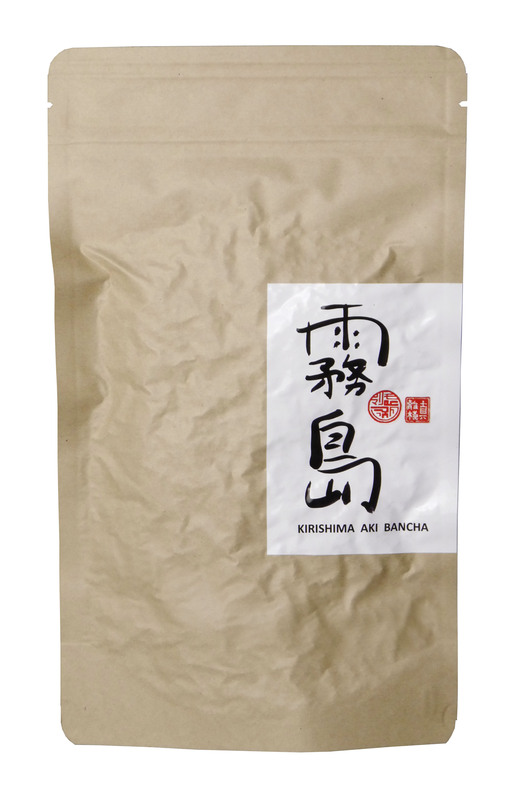 The Kirishima Aki Bancha is certainly not caffeine-free, but for tea freaks, who enjoy a cup of green tea in the evening, this might be a better choice than a green tea of an earlier harvest. After explaining the autumn harvest Shutaro and Kenji relate their work in the tea garden after harvesting the last time in the year. Their work consists mainly of preparing compost and fertilising the tea bushes with organic fertilizer, which is an important preparation for the following year's first flush harvest. There are many distinct and very good teas the Hayashis produce during the first flush harvest, but today we will explore one very high-quality tea from the Kirishima tea garden: Kirishima Tokujou Sencha. 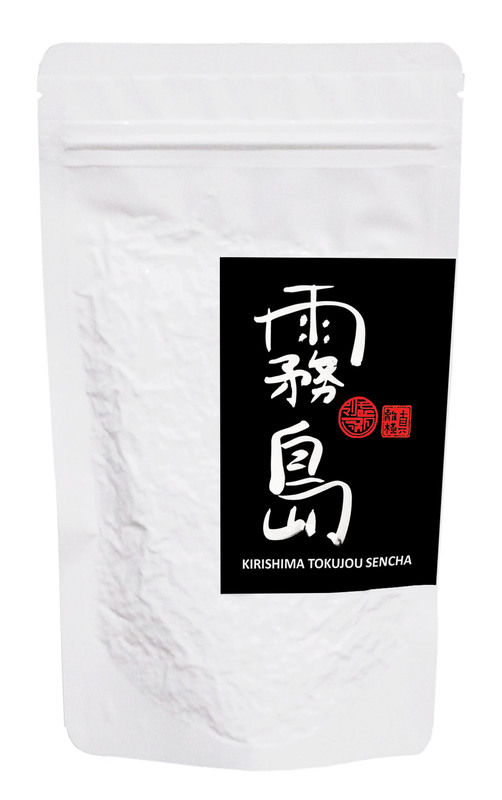 Some fans of Japanese teas might already now the Kirishima Tokujou Sencha from the 2015 harvest. But since this Sencha from Shutaro Hayashi was in high demand, which caused it to be sold out after only six weeks, there is probably only a small group of people who had the luck to get to know this tea in the short period last year. Since this tea is probably almost unbeknownst to most of the Marimo customers, we want to use today's seminar in order to introduce this tea officially and in details. 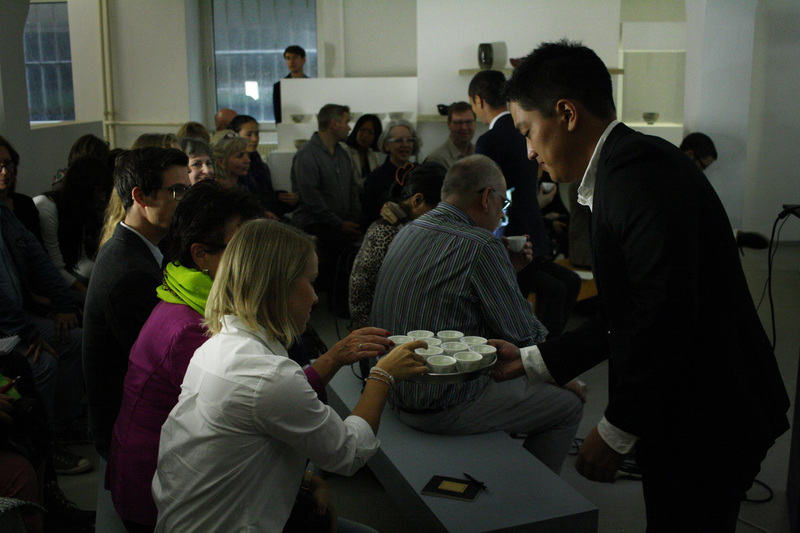 While we holding the seminar, the Sencha is already being infused in the background with water of about 70 degrees and a short infusion time, so we can distribute the tea to all of our guests. The first fascinating thing: A fresh and sweet scent is spreading throughout the whole room. This is the scent of the shaded Asatsuyu from Shutaro Hayashi, which was harvested and processed this year (2016) on two different days. Fans of the Kirishima teas might already know the pure Asatsuyu from Shutaro. The Kirishima Tokujou Sencha is a cuvée of Asatsuyu with different leaves from the first flush harvest, mainly Yabukita, which is harvested at around the same time. The special charm of this cuvée comes from the elaborate tea production style of Shutaro Hayashi, who is responsible for the adjustment of the steaming machine during the time of harvest and tea manufacture. While Shutaro Hayashi tends to steam the leaves of the kabuse Asatsuyu [ shaded leaves from the tea bush variety Asatsuyu ] a bit more intense, he also tends to do the steaming of the leaves from Yabukita tea bushes a bit shorter. The result of the quite deeply steamed Asatsuyu leaves comes from two facts. One is the above mentioned adjustment done by Shutaro Hayashi during tea production, and the other fact is that shaded tea leaves [ kabuse saibai no happa ] are softer than not shaded tea leaves [ roji saibai no happa ], and that the steam goes faster inside the tea leaves from shaded tea trees due to this reason. The leaves from Yabukita are also very fine, but compared to Asatsuyu, which has extremely small and thin leaves, the Yabukita leaves are a bit harder and a bit bigger, while it is still to be seen as a tea bush variety with comparably small leaves. The effect of this story on the taste of the Kirishima Tokujou Sencha is, that the taste of the shaded leaves goes faster in the infusion, so drinking the first infusion means to have more taste of the shaded, more intensive steamed Asatsuyu tea leaves. But, when doing the second infusion, the Yabukita leaves, which take a bit more time to open, since they are a bit harder, are more responsible for the taste of Kirishima Tokujou Sencha while the taste of Asatsuyu goes a bit more in the background. After the tasting of Kirishima Tokujou Sencha, we go a step further in the tea garden year, or to be a bit more precise, we go a step further in the tea garden year in regard to a part of the leaves. The next new tea, which we introduce today to our customers, is the Miumori Kirishima Sencha, for which it is important to take a closer look on the point of time of the harvest. But, before we go too deep in complicated details, let us begin with a quite simple fact: Nearly all leaves, which are harvested for the Miumori Kirishima Sencha stem from tea bushes, which were grown from seeds. These kind of tea bushes are called "Zairai tea trees". Though, let us come back to the talk about the time of harvest: When we talk about Miumori Kirishima Sencha, we talk about a really multifaceted kind of green tea. 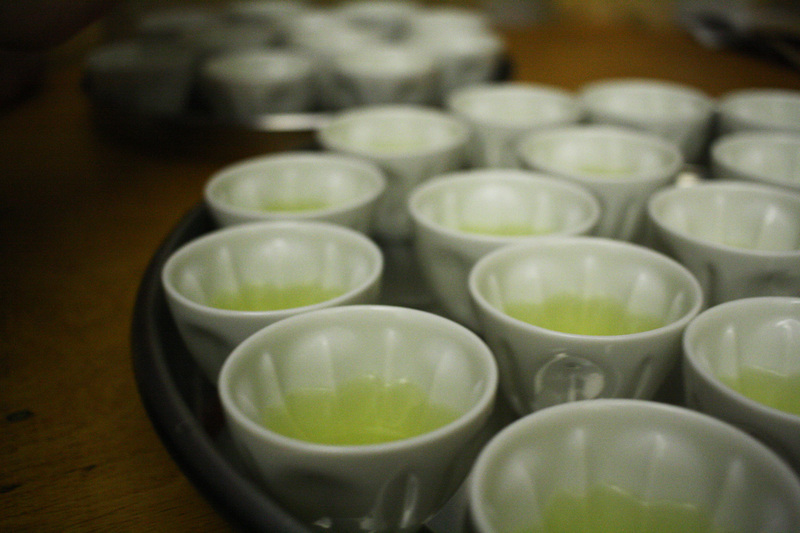 It begins with the fact, that the leaves for Miumori Kirishima Sencha stem from two periods of harvest time. One part is from the first flush harvest, which usually starts around the 20th of April in the organic Kirishima tea garden of Shutaro and Kenji Hayashi, and goes on until the end of April or beginning of May. The second flush harvest, from which the second part of leaves for Miumori Kirishima Sencha stem from, begins around six weeks after the first harvest, which means around the beginning of June. Thanks to the fact, that also the second harvest leaves for this tea are harvest and sorted very finely, even a closer look on the leaves could bring you to the conclusion that all leaves could stem from the first flush harvest. The leaves from both harvests, which are used for the Miumori Kirishima Sencha, mainly stem from Zairai tea bushes, which means from tea bushes, which are not grown from cuttings, but which are grown from seeds. A big part of these seed grown tea bushes have their origin around 1900, when the great-great-grandfather of Shutaro and Kenji Hayashi brought the first seeds for the founding of their organic Kirishima tea garden from Shizuoka, when he was travelling back from Tokyo to Kirishima. For the Miumori Kirishima Sencha some of the leaves stem from shaded Zairai tea bushes [ kabuse saibai no Zairai no ki ], while some also stem from not shaded Zairai tea bushes [ roji saibai no Zairai no ki ]. Some of the Zairai tea bush leaves are steamed quite deeply [ Zairai no fuka-mushi Sencha ] and some of the leaves are steamed quite shortly [ Zairai no asa-mushi Sencha ]. While the comparably shortly steamed batches of the Zairai Sencha have more the typical "Zairai taste", the character of the longer and therefore deeper steamed batches of the Zairai tea leaves do not taste so much differently compared to other deeper steamed sorts of tea. The reason for this fact is simple: The longer the tea leaves are steamed, the less the taste character of the sort of tea bush is to be found. But as mentioned before, the Miumori Kirishima Sencha does not only resort to the deeper and shorter steamed leaves of not shaded tea bushes [ roji saibai no ki ], but also resorts to the leaves of shaded Zairai trees [ kabuse saibai no zairai ]. It is clear, that these shaded tea leaves of Zairai bring an especially sweet taste character into the Miumori Kirishima Sencha, and a lot of Umami, which is naturally not too strong in the cuvée, since the shaded tea leaves are only one part. Though, while we see that we could speak about the Miumori Kirishima Sencha as something like a grand cuvée, it is different to the usual standard of other tea companies and the big wholesalers in Japan, who think of a grand cuvée in the meaning of "many different leaves from different gardens". No, naturally only the leaves from Shutaro and Kenji Hayashi's organic Kirishima tea garden are used, and nearly 100% leaves from their Zairai tea bushes, which were planted already more than 100 years ago by their great-great-grandfather, the founder of the organic Kirishima tea garden. 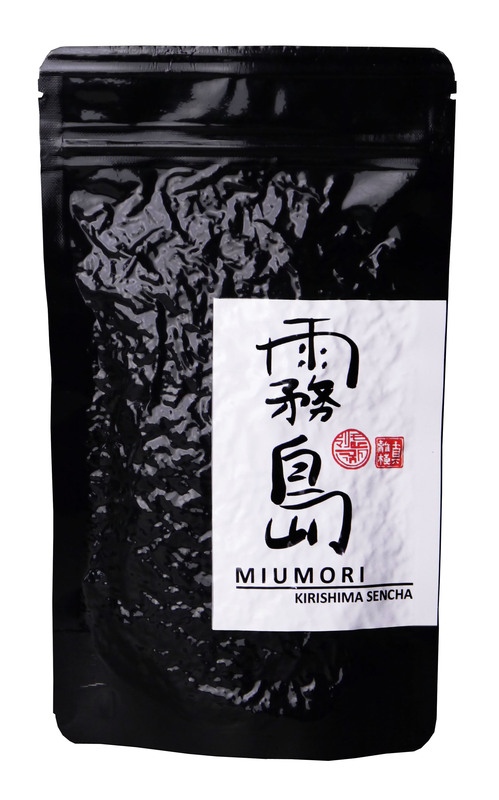 All these facts explain why the Miumori Kirishima Sencha is a very special tea with many rare taste characteristics, but is still easy to prepare, since the infusion time is easier the arrange than for teas, which more narrow taste characteristics. Finally, Shutaro and Kenji Hayashi enjoy the wonderful dinner together with all our guests and us. 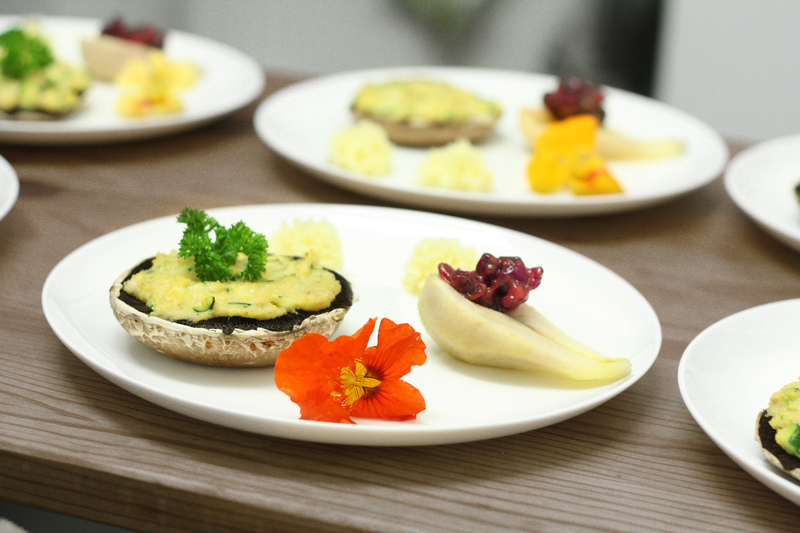 Tobias has arranged this very beautiful menu together with two special cooks from Berlin, who came to Frankfurt for three days to have enough time to prepare it. Naturally, all ingredients are organic, like probably all our guests already assumed, since some of them know that every time we perform a tea seminar, tea workshop, tea dinner or party, we only use organic food and organic drinks. This time we decided to mainly use wine from Germany: not only the Riesling from the rivers Rhine and Mosel, but even some very delicious red wines from the typical red wine region around the river Ahr. Bearing in mind, that not only Shutaro and Kenji Hayashi came so far from Kirishima, to perform the Kirishima Tea Event with us together, but also so many guests came from far cities and far countries, we had the feeling that there is really no other way then to arrange a really elegant dinner for today's evening. 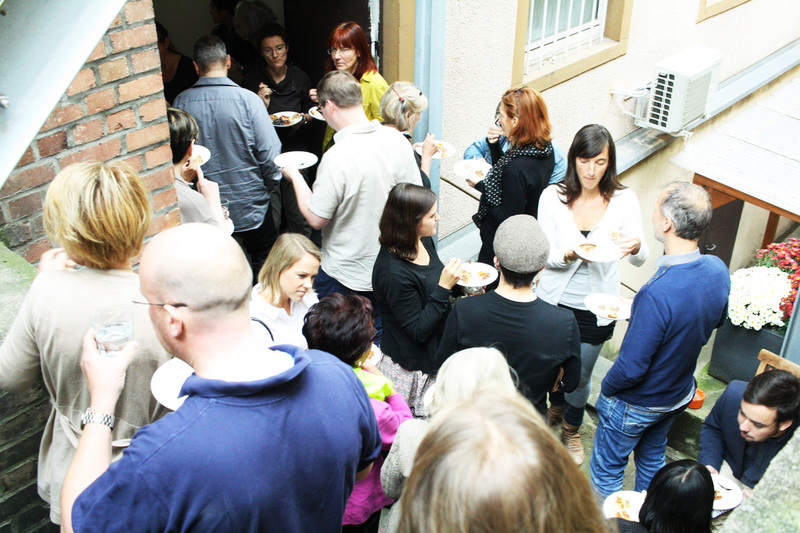 We hope all our guests enjoyed it today. While our guests are enjoying the delicious food, wine and tea during our dinner, MIMIKOTO already begins with their Jazz-Electronic music performance. Some of their songs have a direct connection to Japanese tea topics like the song "KAMA", which refers to the sounds of a metall tea pot when the water for Japanese tea cereamony is prepared. Other songs, like DOURO WINE BIRDS, where especially composed for other events. In this case it was a tea and wine event at the riverside of Douro River in Portugal in 2014. Today DOURO WINE BIRDS is the first song performed by MIMIKOTO, followed by other songs like the above mentioned KAMA, as well as CHAT NOIR and a new track called VAISSEAU SPATIAL WILD CATS. 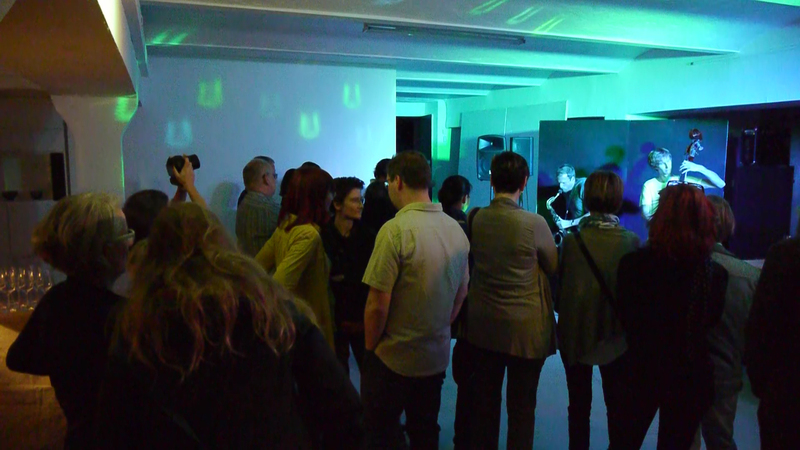 All music today is performed by Alt Saxohone and Upright Bass, together with electronic elements, which come from modifications of the saxohone sound by divers old school effects as well drum loops and electronic beats put through analog filters. Therefore, the music today may also be called a "rare dinner for the ears".